The Garnaut Climate Change Review has found that without mitigation, and in the absence of negative feedback from climate change, global emissions will double between 2005 and 2030. Globally, cities are responsible for up to 75% of the world’s greenhouse emissions and this has provoked a range of responses including large scale city retrofitting to reduce emissions and mitigate climate change. In Australia, it is estimated that cities are responsible for 67% of national emissions. While most Australian cities have set greenhouse gas emission reduction targets, there is urgency in calls for action and diverse groups, including Arup and the Griffith University – Queensland College of Art (QCA) Design Futures program, have presented their approaches to metropolitan retrofits. This is changescaping at a great scale: meaningful, optimistic and intentional. The proposals generated by Arup and QCA Design Futures present very different responses to retrofitting the built environment. Arup’s VEGAS2015 – the Brisbane Retrofit project is a strategic response to climate change intended to catalyse fundamental change in policy and planning. The project acknowledges that there is only a small window of opportunity – until 2015– to drastically reduce carbon emissions. This raises a raft of questions about the future of the built environment and Arup used its extensive resources to facilitate knowledge exchange and provide some leadership by introducing multiple approaches to development and policy. It requires retrofitting our thinking, visions, stories and ideas – memes – of cities and urban communities. VEGAS2015 arose from several years of research through the company’s Foresight Drivers of Change initiative. The work is underpinned by research conducted by UK-based Arup Director, Peter Head, who delivered the 2008-9 Brunel International Lecture in which foregrounded transition into an ecological age. Head explained that “human development is now following a dangerously unsustainable path globally. Waves of investment in low and middle income countries are accelerating this problem because they are following an unsustainable model. Our urban areas and methods of food production consume land and non-renewable resources inefficiently. But we can do something to turn the situation around: we can move towards an ecological age.” The project also has the support of the C40 cities and the world’s largest cities that have pledged to help arrest climate change. VEGAS2015 is one of many localised responses intended to prepare cities and urban communities for the ecological age. The thrust of Head’s research is to find a way to begin to make this transition. One of the most efficient ways of achieving this is by scaling up retrofits – the whole city not just single buildings and spaces. Arup’s strategies for realising this goal addresses the ‘carbon layers’ in a city and investigates policy interventions and funding models (such as pension funds). The citywide carbon layers include land use, finance, clean technology, food, informatics, water, waste and energy. The Federal Government has a centrally vital leadership role to play in this process, particularly in the development of interleaved urban and climate policies. There’s a community based – human interface – dimension to these carbon layers, which are ultimately derived from our own behaviour, habits, tastes and choices. Addressing the relationship between a city and its people may require other kinds of conversations and mobilising in other ways – under the rubric of social, symbolic or cultural capital – to provide spaces for professionals and citizens to not only imagine and create other ways of living, but also come to understand the intricate connectedness of the one and the many. Led by Professor Tony Fry, the QCA Design Futures ‘Metrofitting’ initiative conjured one of those conversations, engaging planning, design and arts practitioners concerned about the future of cities. Fry has led a series of ‘hothouses’ in which Design Futures program candidates collaborate with external participants. These events tend to focus on a specific problem or set of problems, and result in some kind of public presentation, an attempt to participate in and initiate another kind of conversation. The hothouses have provided opportunities for participants to engage with, and develop an approach to, ‘redirective practice’ and ‘sustainment’. In this sense, the process makes demands of participants to think differently about design and its relationship with the world. Sustainment recognises that current approaches to sustainability are limited, tend to offer false hope, and serve to ‘sustain the unsustainable’; redirection is necessary in order to create a viable future. Fry’s ideas are detailed in Design Futuring: Sustainability, Ethics and the New Practice (UNSW Press, 2009), in which the importance of redirective practice is described as “elevat[ing] the seriousness, importance and futuring potential of design”. This involves taking design beyond a disciplinary model so that a transformation of knowledge and of us is enabled. Fry describes this as ‘redesigning design’. In considering the impacts and causes of climate change – ranging from heat islands to environmental refugees to peak oil to dwindling agricultural land – the hothouse group developed a program of design responses to the city and a program of design for the city. 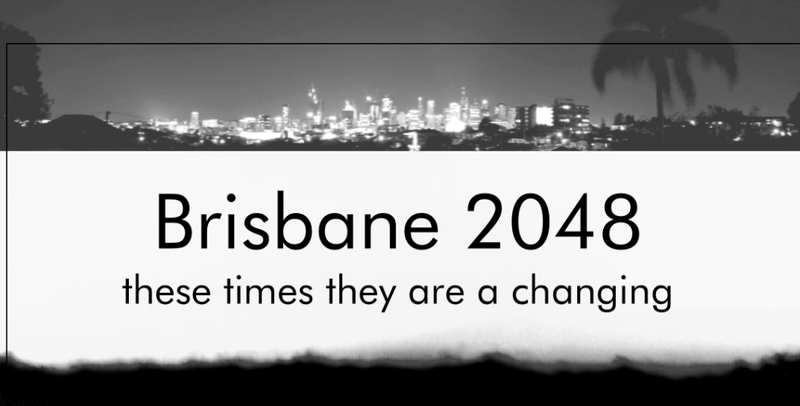 In the event themed Brisbane 2048, propositions for mitigation and adaption included consideration of decentring the city, retrofitting, green screening, infill development, citizen science/design resources, revised building codes and localised renewable energy capture. 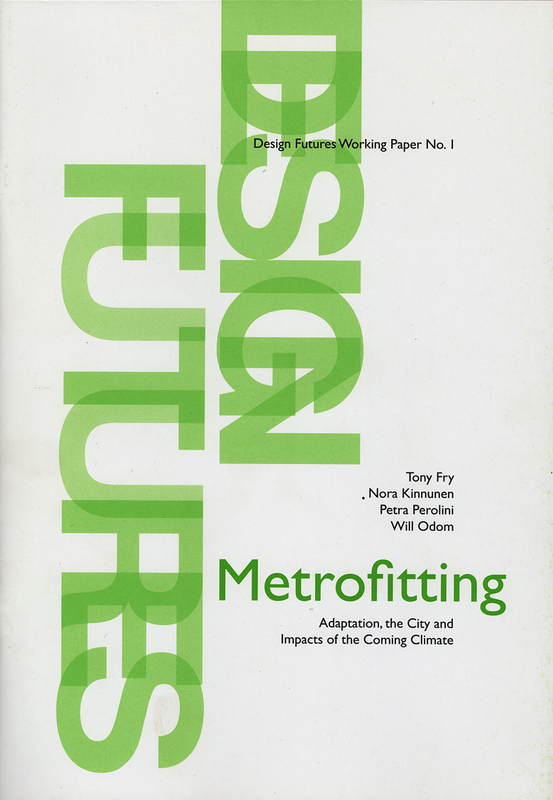 The Design Futures group subsequently produced a publication, Metrofitting: Adaptation, the City and Impacts of Climate Change. Intended to prompt debate, this monograph includes texts by Tony Fry, Nora Kinnunen, Petra Perolini and Will Odom. Setting the scene, Fry’s introduction issues a call to action: “government departments, public services, industry and individual households responding to coming problems in an ad hoc manner would be inefficient and ineffectual. The appropriate response needs to be preventative, adaptive, social, economic, technical and cultural.” Offering a critique of current government approaches to urban planning, the publication sets out a program of ‘metrofitting’ that redirects all that is urban – in its relational complexity and by dealing with what already exists. The process requires imagining what the metrofitted city might be like through the creation of a story and an image: “a metrofitted city not only has to operate to deliver a high level of sustainment but it also has to be seen to have changed: it has to sound different, feel different, appear different and be different.” With this in mind, the publication offers reflection on current city-making orthodoxies with proposals for managing risk and utilities as well as consideration of daily needs such as food and clothing. There’s a seriousness in the propositions for retrofitting and metrofitting that points to the likelihood of a devastating crunch where cultural and environmental crisis collide. Ideas like those offered by Arup and the Design Futures team engender a way of creatively averting or deflecting that possibility. While Arup proposes a pathway through existing relations and structures, Fry articulates a need for a wholly new set of foundations. Changescaping means catalysing these discussions, offering provocations or possibilities and kicking us along the path of change. The retrofit and metrofit projects are, within their own logos, pitched at the need to think beyond the technocratic and normative hierarchies and assumptions of planning and design. They usher the transformative impetus to open a space for debate and exploration of what urban life means now and what it should look like in the future.